At Carolina Hemp Company, an industrial hemp distribution company in Asheville, the sales floor doesn't take up much room, but there's no lack of products. In fact, there's seemingly no end to the uses for the magical cannabis plant, and those uses go well beyond the ability to get someone high. At CHC, customers can find clothes, or the yarn to make their own garments. They can find candles with hemp wicks. Energy drinks. Shampoo. Coffee. Mustard. Hot sauce. Lotion. Tinctures. Vaping oils. Dog treats. The list goes on. All of those items are made from hemp, and most contain CBD oil, a phyto-cannabinoid abundant in the hemp plant. 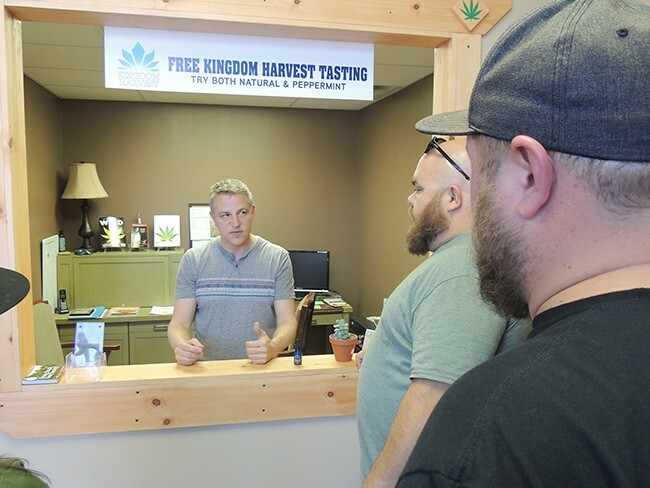 On a recent Thursday, CHC owner and CEO Randall Snyder stood in front of Charlotte entrepreneurs Michael Sims, Dan Hentschke and a couple of their friends, and spoke with a passion that seems to be present in everyone who deals with and advocates for CBD oils. [From left] Carolina Hemp Company owner Randall Snyder talks to Michael Sims and Dan Hentschke, founders of Charlotte CBD. Sims and Hentschke were in Asheville that day on a mission. While CBD products can be found at some head shops and vape stores in Charlotte, or ordered online, this pair plans to open the city's first CBD dispensary, aptly named Charlotte CBD, in coming weeks. While the crew behind Charlotte CBD is still finalizing a location for its dispensary, they plan to launch a website, cltcbd.com, on 4-20, making many of their products available that day. Although some in the CBD industry take pains to separate CBD from marijuana in the minds of the less-informed population, Sims and Hentschke hope Charlotte CBD will be a rallying point to carry on the fight to legalize marijuana in North Carolina. In Asheville, Snyder, after describing a process he and his team had found that allowed them to make hemp extracts with the highest efficacy at the lowest dosage that he believed possible, spoke about why he left the oil and gas industry after 30 years. He was saddled with shame, and wanted to finally do something good for the world, "so I don't come back in the next life as a three-legged toad sitting on a lily pad." Snyder joked with the group, but he's dead serious about his beliefs regarding the potential benefits of CBD oil and the cannabis plant. As he wrapped up his conversation with the Charlotte entrepreneurs before him, he was in full-on advocate mode. "Us ragtag crowd that stands here in front of one another are truly the soul and essence of humanity, and we are going to win this fight," he said, and he meant it. CBD oil, which does not contain THC, and therefore does not make its users high, is believed to have many healing purposes. They include anti-inflammatory, anti-bacterial, anti-nausea, anti-anxiety and many other uses. The oil was made legal for sale in North Carolina with the passing of the 2014 U.S. Farm Bill, under which the state later launched a pilot program allowing those who obtain a license to grow industrial hemp. It is through this program that CBD oil is made in the state. I traveled with Sims and Hentschke to Asheville to visit CHC and other hemp and CBD distribution companies that the two are interested in working with upon opening Charlotte CBD. 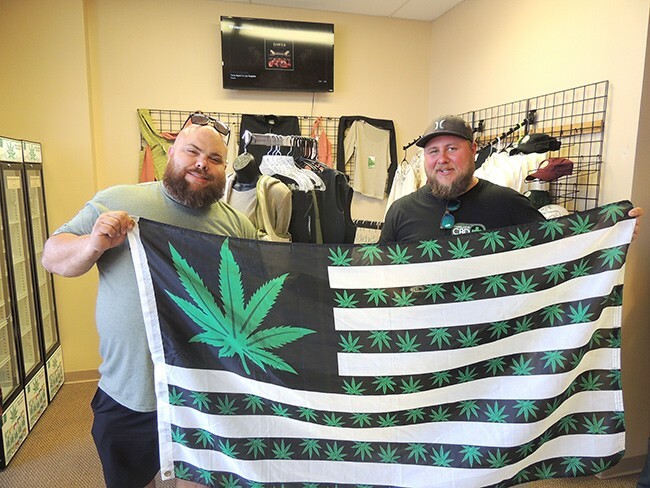 During the trip, Sims explained that the idea for the Charlotte store was born out of his trips with Hentschke to visit marijuana dispensaries in California, Oregon and Washington. Sims and Hentschke go shopping for hemp-based products at CHC. Sims was impressed not only with the cleanliness and professionalism at the dispensaries he visited, but also with the one-on-one customer service. He plans to model Charlotte CBD's operations after what he saw in those states. "We're going to have it set up just as the dispensaries out west, where you have a waiting area you come to, and then you allow people to come back in small groups, so you can give more of an intimate, personal experience in medicating themselves or healing themselves the way that they want to," Sims said. "What we're going to do is not only sell the product, but we're looking to educate people." That may be an uphill battle, as there's a large amount of misinformation surrounding CBD oils, making it harder for those who want to run a legitimate business to even get started. Terri Long launched her company, CBD Oil Source, from her home in Huntersville last fall. She became interested in medical cannabis use after suffering for years from fibromyalgia. No pharmaceuticals helped Long, so she began researching natural cures. By the time Long opened CBD Oil Source, she had cured herself of fibromyalgia through healthy eating, but remained intrigued by the cannabis plant. She left her high-paying job as an IT analyst with Duke Energy to pursue her newfound passion. "I love every moment of it. It still takes a while to get a business up off the ground and functional and profitable, but the feedback I get from people has been so amazing," Long said. "Some people say I'm their angel. People are crying when they find out about it. And now I can't imagine someone wanting to do anything different." Life in the CBD industry is not without its hurdles, however. A lack of impartial research studies means there's not much documented proof of the results that advocates say they've been witnessing for years. The Charlotte CBD counts out CBD Honey Stix they purchased from CHC for their new dispensary. The Food and Drug Administration has not verified claims about CBD, and the government limits what companies are allowed to say in their packaging, prohibiting the use of verbs like "cures" or "treats." Long is not allowed to use Facebook or Google to advertise CBD Oil Source, which operates exclusively online. She said insurance companies "won't even look at me," making it impossible to participate in public vendor markets or events. 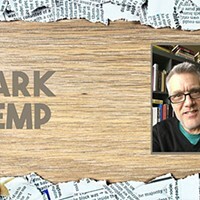 Adding to the stigma already facing CBD oils are misleading news reports that paint CBD as a dangerous drug, Long said. In March, a clerk at a vape store in Mooresville was arrested after a high school student overdosed from vaping a synthetic cannabinoid falsely packaged as CBD oil. In February, two owners were arrested with more than 300 bottles of synthetic oil. CBD oil figured strongly in the headlines of both stories, despite the products in question being synthetic. Following the Concord arrests, police there released a statement calling all CBD oils illegal, which was then falsely reported by multiple local news outlets. "The news isn't very clear. They just say, 'Oh, teach your kids to watch out for CBD.' Do they mean CBD laced with street drugs? Or CBD not from a reputable company?" she asked. "It's a challenge. [Consumers] hear CBD and children getting sick or people getting shut down and they really only hear the headline. It's hard because I run into it all the time and I have to re-educate them. People are really changing their mind and they're willing to try something natural but I still do run into people who say, 'No, no, no, I heard that you better not take it. It's scary.'" What's scary for Long is the risk of raids and arrest. Despite knowing she's in the right, legally, she said the risk is a major factor in her decision to stick strictly to e-commerce for the time being. "They can arrest you and confiscate your product. If you go to court, you'll win, but you may not get your product back," she said. "The police don't even seem 100 percent clear. It's still a touchy area." Will Oseroff, owner and founder of Blue Ridge Hemp, a hemp production company with a CBD dispensary that runs out of the back of a T-shirt shop in Asheville, said he's built a good relationship with local police and the district attorney there. Oseroff holds meetings with the law enforcement community whenever he plans to introduce a new product. Oseroff's first involvement with CBD oil came when a loved one suffering from fibromyalgia ran out of pharmaceutical and alternative options. He said the oils he ordered off the internet for her were the only things that helped, and she soon saw the same results in friends who also suffered from fibromyalgia and other painful disorders. When Sims and Hentschke visited Oseroff's Blue Ridge shop, he was just a week or so from beginning to sell CBD flour, which looks, smells and tastes like marijuana, but has no THC. He said he plans to sell pre-rolled "joints," but worries about police reaction. 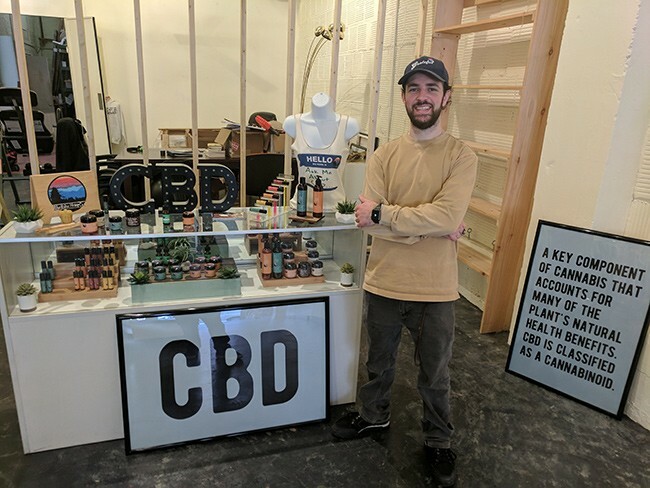 Will Oseroff of Blue Ridge Hemp Company is building out a bigger storefront in his space, connected to a t-shirt shop in Asheville. "We're going to go sit down with the local authorities, show them the product, show them the packaging," Oseroff said. "We'll have a system with them where we're able to document all the sales of it. If they pull somebody over and they have one of our things, they can call us and be like, 'Was this purchased in your store?'" For Sims and Hentschke, the risk of arrest for dabbling in an industry that exists in a seemingly gray area of state and federal law is something they have thought a lot about and discussed at length with their lawyers. Sims believes CBD flies under the radar of most local law enforcement in Charlotte, as police have more important things to do. But even if Sims is hassled, it's a risk he says is worth taking. "Many people in this business, you know what you're getting into," Sims said. "And it's like, we're fighting the good fight. I think the consensus is, if we go down, we go down, and I think in history and over time we will be proven to be on the right side. But it's a true risk." Sims and Hentschke don't want to go completely unnoticed, either. They hope being at the forefront of the CBD business today will prepare them and their company to lead the way in the logical next step beyond CBD oils: the end of marijuana prohibition in North Carolina. "We're going to go ahead and go by these rules that everybody goes by out west," Sims said. "So when we do have the opportunity to go legal, we can say, 'Hey look, we've been doing everything by the book legally for all these years, give us an opportunity to hopefully be part of the pilot program when that does change.'" Sims hopes the company can partner with Charlotte NORML and other advocacy groups to host meetings at the dispensary. He and Hentschke have even discussed with their lawyer the possibility of becoming registered lobbyists at the state level. As Sims, who just six months ago became a first-time father, explained why he decided to enter an industry so full of uncertainties, his passion for it became clear. I asked what he thought about former House Speaker John Boehner, who the previous day had announced he was joining the board of a cannabis investment firm, despite once stating as a politician that he was "unalterably opposed" to legalization. "I actually laughed about the John Boehner thing," Sims said. "The whole irony is that all these politicians that have for their careers fought cannabis and everything that goes along with it — not because they fear it, not because they think it's dangerous, but simply because they're in the pockets of big pharmaceutical companies, tobacco companies, alcohol companies and privatized prisons, which are all paying them." As Sims spoke, he let out a series of ironic chuckles that weren't as comedic as they were menacing, the sound of a man who knows too much about something he hasn't been able to do anything about, until now. 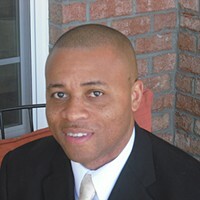 "And not only that, we have a younger generation of politicians coming up that realize there is no harm in this plant. It's kind of like any movement, it's like a muffled sound and it grows into a roar, and before you know it you start seeing it everywhere and [opponents] start jumping ship." Until then, it can start with a shop.